Mohanalal’s Latest Malayalam Movie Peruchazhi is releasing today (29th August 2014) All over. Its the Onam 2014 Gift of Mohanal to the Malayalees. Peruchazhi is Written and directed by Arun Vaidyanathan. Ajayan Venugopalan is wrote the dialogues for Peruchazhi Movie. 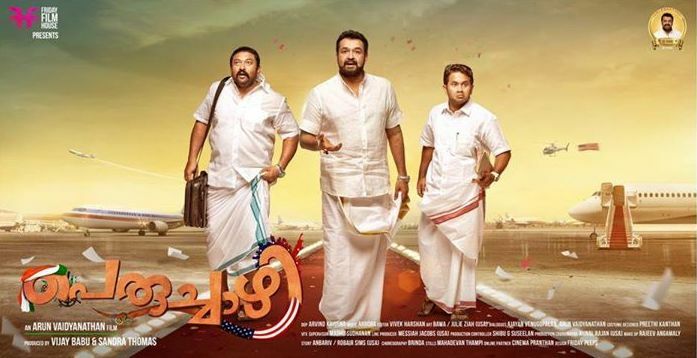 Peruchazhi is a Malayalam political satire film, Its produced by the banner Friday Film House. Vijay Babu and Sandra Thomas are the producers of The Movie Peruchazhi. The Movie Peruchazhi is releasing on Indian and USA 29th August and 4th September 2014 In UAE. Peruchazhi is the most awaited movie of 2014, its made in big budget. The first look promos, trailers are promising and the fans expecting a pure entertainer. Monalal’s Last release was Koothara and Mr.Fruad, these films didn’t make any Impact on Box Office. Peruchazhi is the 3rd Malayalam movie of Mohanalal in 2014 After Mr.Fruad and Koothara. Jilla is another lal film released in 2014, its in Tamil Language. Drishyam released in 2013 was the last success film of Mohanlal in Malayalam. Mohanlal is playing the role of Jagannathan in the movie Peruchazhi. There a big supporting team for him in this film. Baburaj as Pottakkuzhy Jabbar and Aju Varghese as Vayalar Varkey are in the left right of Jagannathan. Mukesh as Francis Kunjappan, Vijay Babu, Ashvin Mathew, Aneesh Menon, are in the male lead roles. Ragini Nandwani as Jessy is the heroine of this movie. Ragini Nandwani is playing the role of an Anglo Indian love interest of Jagannathan. Sandra Thomas, Poonam Bajwa are rest in female support. In the technical side Arrora is composing the Music for Peruchazhi. The lyrics were written by Rajiv Nair, R. Venugopal and Blaaze. Arvind Krishna is handling the cinematography and film Edited by Vivek Harshan. Peruchazhi movie story is completely based in USA. This is the first Malayalam film Shot in Universal Studios in the Hollywood US. Adichu Polikkam, Enthu Cheiyyan, United States of Adipolica Theme, Po Mone Dinesha, Don’t Mess With Me are the sound Tracks of Peruchazhi. Peruchazhi Satellite Rights – We have already published that The Malayalam Channel Amrita TV Purchased the Satellite Rights of Peruchazhi. This is the very first Onam 2014 Release. Rajadhi Raja, Villali Veeran, Bhaiyya Bhaiyya , Sapthamashree Thaskaraha are the Other films for Onam 2014.
waiting for perchazhi , it will rock sure.